If your dream wedding includes getting married via webcam, you should sign up for Ikea's newest service. 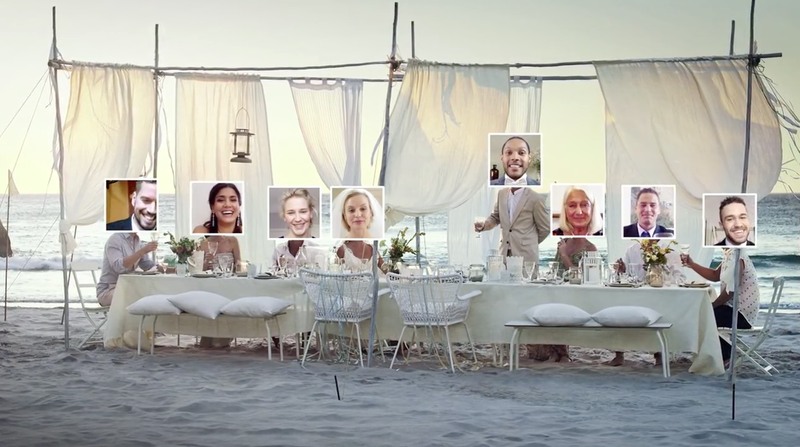 The Swedish furniture chain has launched "Wedding Online," a (somewhat) tongue-in-cheek site that lets users pick a theme and setting—beach, boat, circus, forest, rooftop—and then hold a remote virtual ceremony by live-streaming their heads (and those of their guests) on to pictures of easily assembled wedding bodies. "It's love at it's simplest," says the launch ad. Which is true, in the same way that before the Internet, a drunken Vegas wedding with someone you just met was love at it's simplest. Don't worry though, romance isn't dead: The spot suggests you actually sit in the same room as your fiancé and the officiator—just put your laptops between you, and spare your family and friends the trouble of an actual destination. It's not completely a gag. You can get married this way—for Swedish citizens, the site even supplies the proper paperwork. But mostly it's a way to show off the brand's products—you can click through items like bowls and light fixtures featured in the different settings to learn more and buy them. If you do decide to tie the knot this way, instead of serving people real mediocre food, you can always just send them Ikea's Swedish meatball emoticons.